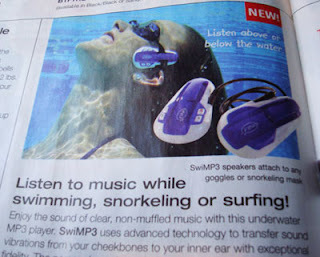 I was amused by this waterproof mp3 player. My thoughts are: isn't it nice to have a few moments of quiet? Wouldn't it be good to use the swimming time to just let your head rest a bit? 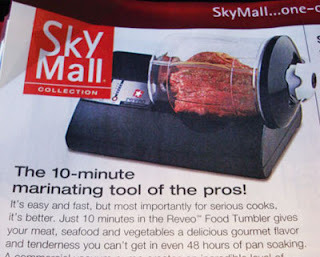 And the 10-minute marinade device for $150. They say time is money, but unless you do tons of marinading, that's a lot to spend. And of course I'm skeptical about how well a marinade could "take" in just 10 minutes. 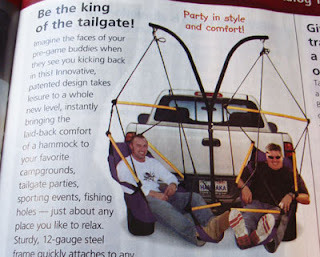 Finally, my favorite pick - the tailgate party chairs. I'm thinking the weight limit of 250 lbs. per chair might not be enough. For $200, though, how much easier would it be to throw some folding camp chairs in the back of your pickup and have a lot more left over for party consumables? so yes the quite is nice, I love the peacefulness of swimming, but pro swimmers swim for HOURS each day... I'd like a little music to drown out the screaming of my muscles!